Cawdor Tavern is situated in the beautiful conservation village of Cawdor and is easily accessible from any direction. Customers seek us out from Beauly, Dingwall and the Black Isle to Inverness, Elgin, Aviemore and beyond. 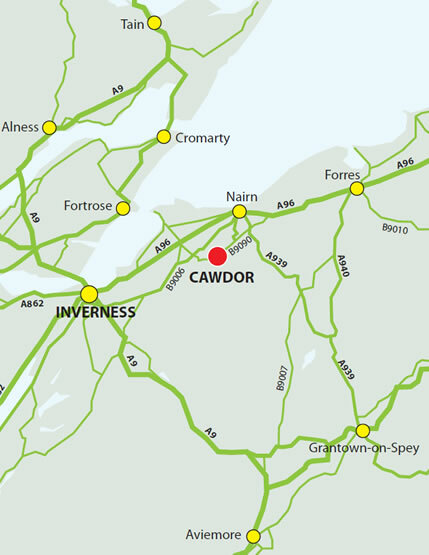 Cawdor Tavern is in Cawdor village centre, only 5 miles from Nairn and 12 from Inverness. From the A96 Inverness to Nairn, take the B9090 at the Gollanfield junction (follow signs for Cawdor Castle until you reach the village centre). From Culloden Moor take the B9006 and join the B9090 after Croy at the Clephanton crossroads. From Nairn either take the A96 to the Gollanfield junction and follow Cawdor Castle sign or leave Nairn via Cawdor Road joining the B9090 right to the village. Very close to Inverness airport.